I made the mistake of going to Trader Joe’s on an empty stomach, which means I wanted to try everything!! 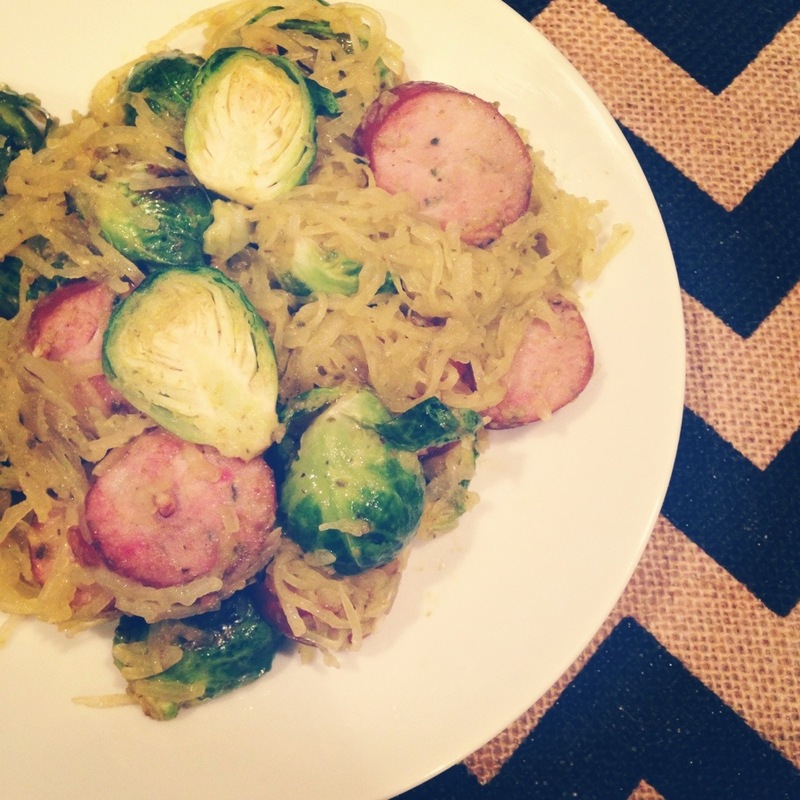 The garlic herb chicken sausage caught my eye and seemed really versatile. Since I had a spaghetti squash waiting to be used at home, I decided to make a healthy pasta dish with some of my favorite flavors. The pesto and garlic herb sausage worked perfectly together! I will definitely be making this filling, flavorful meal again. Preheat oven to 400F and line baking sheet with foil. Slice spaghetti squash in half (lengthwise). Scoop out seeds and place cut-side down on prepared baking sheet. Cook for 35 minutes, until tender. Meanwhile, place sliced Brussels sprouts in a large bowl. Add 2 Tbsp. olive oil and salt, toss until evenly coated. Place on foil-covered baking sheet and cook for 20 minutes, until crispy on the outside and fully-cooked inside. You might want to flip them halfway through to get both sides. While Brussels sprouts are cooking, heat remaining 1 Tbsp. olive oil in skillet over medium-high heat. Add sausage and cook, turning occasionally, until lightly browned, about 6-8 minutes. Add garlic and continue to cook for an additional 2 minutes, until garlic is fragrant and sausage is browned. Use a fork to scrape out the “spaghetti” strands and place in large bowl. Add cooked Brussels sprouts, sausage and pesto. Toss until fully incorporated. Serve warm with freshly grated Parmesan cheese sprinkled on top.